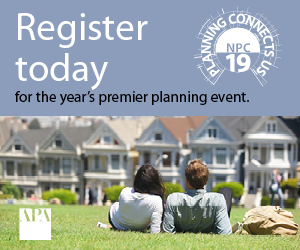 Pedestrian-oriented shopping streets can be key to making communities more livable, particularly when they are well designed, managed and strategically connected to networks of public transit, pedestrian paths and bike routes, says planning consultant Luis Rodriguez. More and more people around the world want their communities -neighborhoods, villages, towns and cities- to be more liveable. Liveable communities provide residents with opportunities to enjoy a high quality of life by allowing them to live in a variety of housing options and to walk, bike or take public transportation to go to the places they most frequently need to go every day, such as work, schools, grocery stores, shopping malls, parks, recreational areas and health facilities. Community mobility networks -such as networks of pedestrian paths, bicycle routes and public transportation - in combination with other community components - such as pedestrian-only shopping streets (POSS), dedicated cycling routes, and liveable streets- can make a major contribution towards making our communities more liveable. 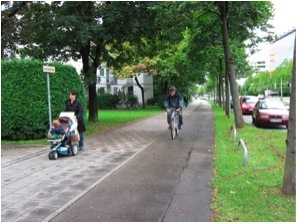 Based on a study tour conducted late in the summer of 2010, this article will describe POSS, discuss four successful POSS examples in Germany, identify the underlying principles for the success of a POSS, and will show that communities can be designed so that residents can go to places comfortably without having to drive their private automobiles at all times. 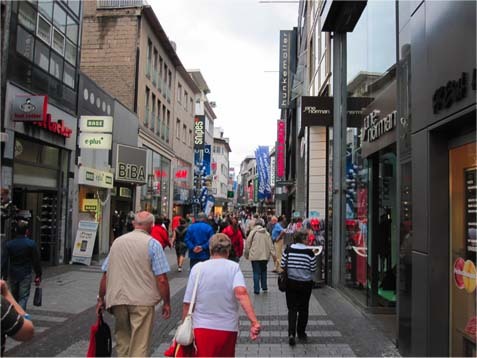 Pedestrian-only shopping streets (POSS) have been very popular for many years in many European cities, but they also exist elsewhere. They usually consist of one single street, or two or more streets that interconnect with each other, often through a square, to form a continuous and longer lineal street. The heart and central part of a POSS is a street-wide outdoor landscaped zone for pedestrians which is often designed and managed to achieve a desired environmental character and socio-economic outcome. Arranged along both sides of this pedestrian zone, there is a variety of establishments that sell goods and services to the public, such as souvenir shops, boutiques, restaurants, bars, coffee shops, grocery stores, bakeries, lifestyle and fashion stores, banks and department stores. This variety of establishments frequently includes famous churches, historic buildings, museums, weekly market days with fresh produce, seasonal attractions and other special events. When a POSS is long enough, it is possible to find a few side streets along the POSS. 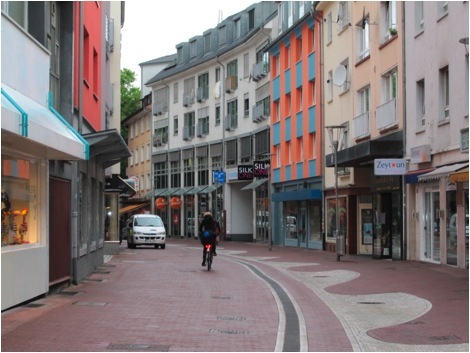 These side streets usually start-off, or loop, at or near the exterior edge of the pedestrian zone of the POSS and then lead away from the POSS and towards the next street. The side streets of a POSS most often extend the shopping from the POSS, have the traditional sidewalks, allow cars and other vehicles, permit on-street parking, and contain other land uses, such as housing and commercial offices. Fahrgasse, one of the many side streets of the Zeil -the most popular POSS in downtown Frankfurt. POSS are often furnished with car parking along the next streets on either side of the POSS and in other nearby areas. Furthermore, the large department stores located along the POSS provide indoor parking for their customers in their own buildings. So, many potential shoppers come from these parking areas. But the main flow of potential shoppers coming into a POSS consists of pedestrians and bikers living in the area or the immediately surrounding areas, and of public transportation riders living elsewhere in the city or its outer suburbs. Tourists can also be an important share of this in-flow of potential shoppers. Although POSS are intended for pedestrians only, they also allow emergency and police vehicles, when necessary, as well as service and supply vehicles outside the shopping hours. Cyclists are allowed to ride their bicycles at walking speeds in all POSS in some cities and in some POSS in some cities, however, when these POSS are very crowded, most cyclists prefer to park their bikes in the designated bike parking areas along the POSS and then walk from there to wherever they need to go, other cyclists favour to walk their bikes along with them. Cyclists are not allowed to ride their bicycles in some POSS of some cities. 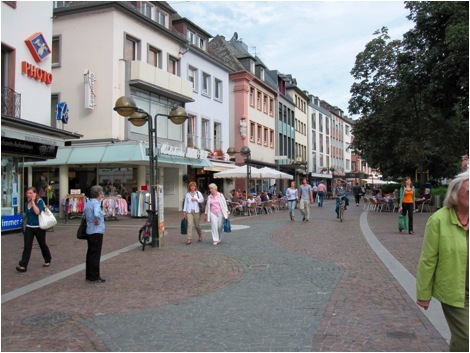 To make cycling-and-shopping combined easier, some cities, such as Frankfurt am Main, have designated bypasses for fast cyclists, which run close (within one or two blocks) and parallel to the POSS, such as the Zeil-bypass in Frankfurt. A delivery van and a biker in Steingasse, a popular POSS in Mainz City, early in the morning before shopping hours. POSS are usually crowded with shoppers, window shoppers, tourists and other people of all ages and from all walks of life who come to shop, observe, stroll, eat, recreate, socialize, relax, have some fresh air, or just have some fun. Water fountains, sitting areas, sculptures, street entertainers and musicians, and restaurants and outdoor cafes make POSS very lively, attractive and enjoyable; and the absence of cars and other vehicles makes them safe. During special celebrations and events, such as the Christmas season and weekly market days, POSS are particularly busy and vibrant. 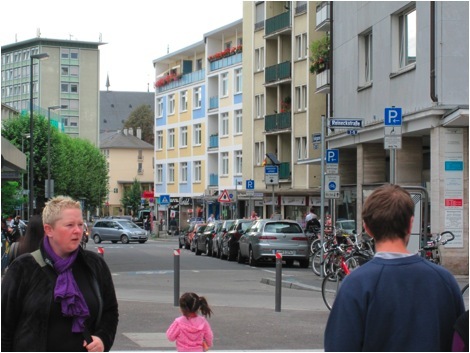 Many European POSS are able to generate very high volumes of pedestrian traffic. 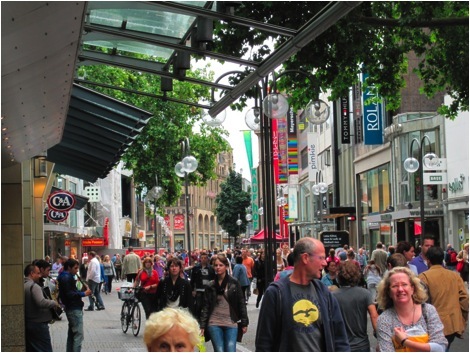 According to the City of Cologne's Tourist Office, a nationwide simultaneous counting of passers-by conducted by Jones Lang LaSalle in German shopping malls on April 10, 2010, indicated that Cologne's Schildergasse pedestrian street was Germany's most visited shopping boulevard on that Saturday, bringing in 13,280 visitors between 1 and 2 in the afternoon. 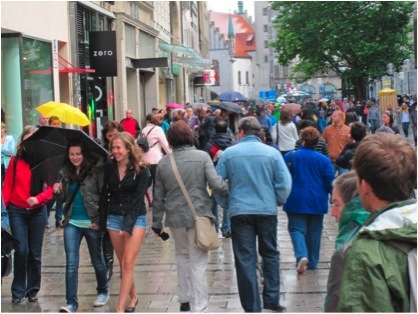 Munich's Kaufingerstraße pedestrian street was second with 11,905 visitors, and Frankfurt's Zeil pedestrian street was third with 11,420 visitors. It is very apparent that these high volumes of pedestrian traffic can, in turn, result in good business and economic success both for POSS owners and retailers. Cologne's Schildergasse (street) at 12:50 in the afternoon of Friday, August 27, 2010. Much of the potential for POSS to endure ongoing success depends on five strategic principles: first, they have to be readily and easily accessible from, or mixed with, high density residential areas, office buildings, and other businesses and places of work; secondly, they have to be extremely well connected to, and served by, the public transportation system; thirdly, they have to be strategically interconnected with the city's pedestrian system and bicycle routes; fourthly, they have to offer convenient bicycle parking facilities at key access points along the POSS, and/or bicycle services that allow bikers to either bike back to their original point of arrival, or between the parking facilities provided, particularly when the POSS are very long; and fifthly, they have to be planned, designed and managed on an ongoing basis for success. The following four POSS examples in Germany can exemplify some of these principles. The first POSS example is in the historic sector of the City of Cologne, where two streets (Hohe Straße and Schildergasse) interconnect with each other to form one of the most successful POSS in the country. The two streets when combined are 1.18 km long. Hohe Straße is 680 m long and runs southwards; it starts a few steps from the magnificent Gothic Cathedral of Cologne -an internationally renowned and heavily visited tourist attraction- and a few meters from Cologne's main train station -which is one of the most important rail hubs in Europe. Hohe Straße ends at the Galeria Kaufhof, a famous German department store. Schildergasse is 500 m long and runs westwards from the Galeria Kaufhof to the Neumarkt train station, which is a public transport hub for urban subway trains (U-Bahn), suburban light railway trains (S-Bahn) and city buses. Without a doubt, the exceptional location of the Hohe Straße & Schildergasse POSS - with its proximity to the world famous Cologne Cathedral and its strategic connections to almost all forms of local public transportation modes, and intercity express and high-speed trains with further connections to regional, national and international destinations- is a major contributing factor to its success. Hohe Straße (street) in Cologne at 11:20 in the morning of Friday, August 27, 2010. The second POSS example is in the heart of the City of Frankfurt's downtown, where five streets (Große Bockenheimer Straße, Kalbächer Gasse, Biebergasse, An der Hauptwache and the original Zeil street) interconnect with each other to form "the Zeil" -one of the most popular POSS in Germany. The Zeil runs east-to-west for 1 km, from the Konstablerwache square to Hochstraße (street). Along the Zeil, there are three large public squares ( Konstablerwache, Hauptwache and Ratheneau) and an underground tunnel that carries urban subway trains (U-Bahn) and suburban light railway trains (S-Bahn) both, in east and west directions. The Konstablerwache and Hauptwache squares are 550 m apart from each other. Each of these squares houses an underground station that serves as a public transport hub for U-Bahn and S-Bahn trains. The Konstablerwache station also has stops at ground level for tramways and buses. 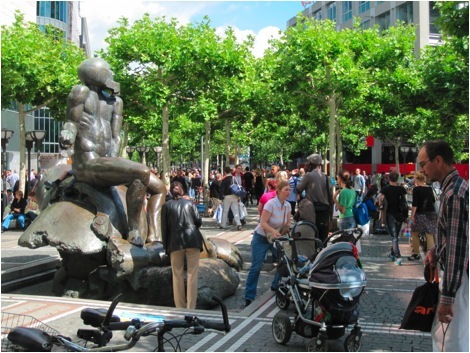 Much of the success and fame of the Zeil seem to hinge on its strategic location, with excellent connections to all sort of networks of public transportation, pedestrian paths and bicycle routes. However, there are other important factors that seem to act as additional driving forces both for the success and high popularity of the Zeil. These include: the striking and modern architecture of the buildings in the street that house some famous department stores, such as the Galeria Kaufhof and MyZeil; the three large public squares along the street which provide opportunities for people to relax, socialize and enjoy the weather; the lively Saturday farmers market at the Konstablerwache square; the street entertainers and musicians often attracting large crowds of people; and the numerous side streets off the POSS which are enriched with a variety of land uses, such as high-density housing, office and commercial buildings, specialized restaurants and classic fashion stores. The Zeil in downtown Frankfurt at 2:29 in the afternoon of Saturday, August 28, 2010. The third POSS example is in the historic sector of the City of Munich' downtown where two streets interconnect with each other to form the Kaufingerstraße-Neuhauser Straße (street) -one of German's POSS that attracts millions of tourists a year. The Kaufingerstraße-Neuhauser Straße (street) is 750 m long and runs nearly westwards from Marienplatz City Center to Karlsplatz (Stachus). Marienplatz is an internationally famous public square that houses Munich's Old and New Town Halls. Karlsplatz (Stachus) is another public square located half-way between Marienplatz and the city's main train station. Each, Marienplatz square and Karlsplatz square, houses an underground station that serves as a public transport hub for urban subway trains (U-Bahn), suburban light railway trains (S-Bahn), and trams and buses. The two stations are interconnected by an underground tunnel that runs along Kaufingerstraße-Neuhauser Straße and carries suburban light railway trains (S-Bahn). There are four underlying reasons why Munich's Kaufingerstraße-Neuhauser Straße (street) entices so many people. First, this POSS is extremely well connected to all sorts of public transportation networks; second, it houses famous historic buildings, such as the city's New Town Hall and the magnificent Cathedral of Our Dear Lady (Frauenkirche); third, it offers attractive shopping in a variety of small shops, large department stores and specialized fashion stores; and fourth, it is well connected to a series of pedestrian path and bicycle route networks. According to the Study of European Best Practice in the Delivery of Integrated Transport, in 2001 Munich already had 5.5 km of pedestrian-only streets. The Munich's Cycle Network is described in a 2007 report by the City of Munich's Department of Public Construction as follows: "With a total length of 1,200 kilometres, the Munich Cycle Network offers an outstanding infrastructure for cyclists. There are 15 different routes leading star-shaped from Marienplatz in the very centre of the city outbound towards the Munich suburbs. Within the central urban area the different routes are connected through the outer and the inner cycle ring. Four "green strips," the Isar and Würm cycle paths as well as the Northern and Southern cycle paths complement the network." The following extract from the City's on-line report Five Good Reasons to Ride a Bike further exemplifies the quality of Munich's bicycle route networks: " a bike will get you through Munich more quickly and flexibly than any other means of transport. What's more, you'll be relaxed, you won't harm the environment, and it's good for your health." Pedestrian and bicycle paths run side by side in Munich's Arabella Park. Munich's Kaufingerstraße-Neuhauser Straße (street) at 12:46 in the afternoon of Monday August 30, 2010. The fourth and last POSS example is in Mainz, a small city of just over 200,000 people that lies about 40 km west of Frankfurt. Mainz has a comprehensive bus and tram network that serves the entire city and its surroundings; and next door to the central part of the city is the Mainz central train station (Hauptbahnhof) which functions as a hub for suburban light railway trains (S-Bahn), local trams and buses, and high-speed and other express trains travelling to-and-from Switzerland, Italy, southern France, eastern Europe and all parts of Germany. More than 160 trains arrive in, and 80,000 passengers and visitors use, the Mainz central train station daily. But what seems to be even more interesting about Mainz is that the central part of the city feels dense and compact, safe, lively and attractive. Everything seems to be so close and readily accessible that everyone wants to walk or bike to get to wherever they need or want to go within this part of the city. In the central part of Mainz you will find many historic buildings, museums, famous churches, public squares, lots of high-density housing, mixed-use buildings and neighbourhoods, lots of happy-looking people everywhere, and several shopping districts within which there are three interesting POSS: the Steingasse-Pfandhausstraße-Stadthausstraße street, which is 450 m long and has a few side streets; the Schillerplatz-Ludwigsstrasse street, which is 400 m long; and the Leichhofstraße-Augustinerstraße street, which is 350 m long. Along these POSS, and above the commercial shops and stores, there is a substantial amount of housing and office space. It is very apparent that the housing, in particular, generates a high share of the pedestrian traffic in the POSS, thus contributing to make the POSS so lively, vibrant and successful. The Schillerplatz (street) in Mainz, at 5:42 PM of Thursday, August 26, 2010. 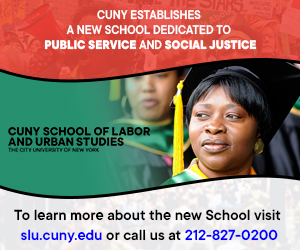 We can make our communities more livable. 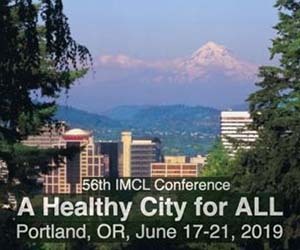 The examples in this article suggest that when POSS are well planned, designed, managed and strategically connected to key community mobility networks -such as networks of public transit, pedestrian paths and bike routes- they can play an important role in making our communities more livable. 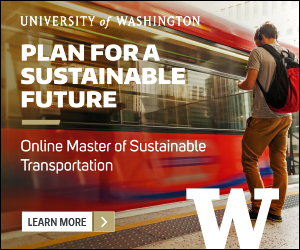 This means that people can have increasing opportunities for walking, biking, socializing and for being safer and probably happier than in many of the traditional shopping streets that carry busy car-traffic. It also means that communities can be designed so that residents can go to places comfortably without having to drive their own private cars at all times. The examples also suggest that POSS can attract big crowds of people of all ages and from all walks of life every business day, thus increasing the potential for participating real estate owners and entrepreneurs and commercial retailers to succeed in their business. 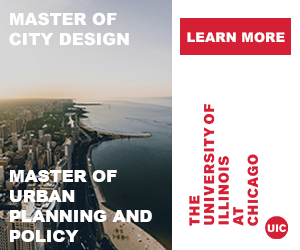 Luis Rodriguez is a housing and urban planning consultant, a Member of the Royal Architecture Institute of Canada and a former senior researcher with Policy and Research at Canada Mortgage and Housing Corporation (CMHC) in Ottawa. He had a highly distinguished career at CMHC and is highly recognized in Canada and abroad for his excellent work, unique expertise and innovation in seniors housing and community research. He is currently examining Canada's socio-demographic and economic trends and the potential implications for housing and communities. All images in the article by the author, ©2010.